Welcome to Writing Children's Books with Robyn Opie and my special guest Sandy Fussell. Sandy is the author of the popular Samurai Kids series. This week the fourth book in the series, Monkey Fist, was released by Sandy's publisher Walker Books and Sandy has been busy touring. We are honored to have Sandy here today to talk about her experiences with Samurai Kids and Monkey Fist. So over to Sandy, my fabulous guest blogger. In the beginning there was just one story – Samurai Kids. Sixteen months later, Samurai Kids is a series and the fourth book, Monkey Fist, has just been released. Two more titles are scheduled. I get emails from readers immersed in the story and anxious to know when the next instalment is coming. So why has the series been so successful? Samurai and ninja make great action heroes. There’s a sense of Cowboys and Indians happening here. The sort of action that makes kids want to swing their swords and throw shuriken stars. Kids want to dress up, to swagger like samurai or sneak like ninjas. One Mum told me after the nightly reading of Samurai Kids, her boys would pretend their dressing gowns were kimonos, brandish cardboard swords and jump from bed to bed. They even broke the bedside lamp. When I tried to apologize, she grabbed my arm and interrupted: “I don’t care about the lamp. This is the first time ever my boys have wanted to have a book read to them. They can’t wait for the next one." Eastern culture is very popular with kids. Children’s television programming has a high proportion of Japanese cartoons ranging from Samurai Jack to American Dragon and Ang, The Last Avatar. Recent movies set in China, such as Kung Fu Panda and Mulan, have been box office successes. Samurai Kids taps into this trend. Martial arts is one of the top ten sports for children in Australia and has been for years. The Samurai Kids learn many martial art skills - not only traditional samurai swordsmanship, wrestling, archery, horsemanship, haiku poetry and flower arranging but also the ninja arts of poison and stealth. They travel to China to learn shaolin fighting and later books will see them in Korea when tai kwon do was first emerging. Kids can see the funny side of Zen, where pure contemplation of nothing is the ultimate enlightenment. It’s an irony that makes kids laugh. As Sensei says: “In Zen, NOTHING is important” and the Samurai Kids learn a lot of NOTHING. Young readers love the puzzle of koans such as “What is the sound of one hand clapping?” and have no trouble suggesting the most zen-like of answers. They identify with the characters. Kids love the fact that the Samurai Kids achieve despite the physical and mental obstacles in their way. They admire blind Taji and one-legged Niya. Big, gentle Yoshi is a favorite. It was my intention initially to leave Yoshi in Japan when they left for China in Shaolin Tiger but from school visits and emails it quickly became obvious readers had a strong attachment to the original group of kids so it was the newcomer, Nezume, who stayed behind to teach swordsmanship to the Emperor’s son. Readers actively engage with the idea of spirit guides. From their feedback I created two quizzes for the Samurai Kids website: Which Samurai Kid Are You? and Which Spirit Are You? These are two of the most popular pages on the site. Children regularly approach me with “I’m Yoshi and my spirit is the Tiger” Sometimes they even roar to prove their point. I get emails suggesting new animal spirits in case I decide to introduce more characters. So now that I’ve worked out why I think the series is successful, I just need to know how to do it again, in a different place and time. Thanks for reading, and I hope you enjoy the latest installment in the Samurai Kids series, Monkey Fist. Dee Scribe Writing – Dee White, author of the recently released YA novel, Letters to Leonardo will be interviewing the narrator Niya Moto to find out what it’s really like to be a Samurai Kid. 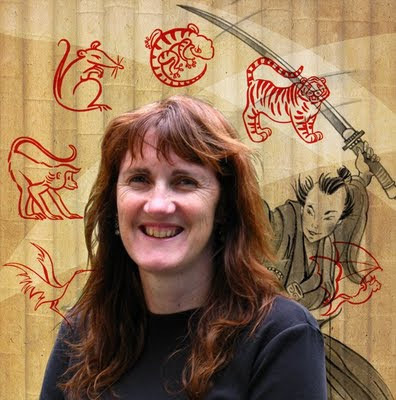 Orangedale Journal – Dale Harcombe, poet and children’s author (latest release The Mystery of Goanna Island) will be interviewing Sandy about writing Samurai Kids. Lets’ Have Words – Sandy will be visiting Claire Saxby, children’s author (latest release Sheep, Goat and the creaking gate August 2009) to talk about the unique challenge in writing a historical novel about a group of children with disabilities. Spinning Pearls – Sandy will be visiting author and manuscript assessor Sally Odgers (too many books to name but the Jack Russell Dog detective series and the e-Manual (Giving our Kids) A Reason to Write are just two examples) to discuss ‘the hour of the rat’ and how she gets to Japan and China inside her head. Tales I Tell – Storyteller and author Mabel Kaplan interviews Sandy about how her interest in Japanese and Chinese history has influenced the series. Mabel uncovers the meaning of Monkey Fist. Sally Murphy’s Writing For Children Blog – Sandy will be visiting Sally Murphy (author of many books for children including the verse novel, Pearl Verses the World) to talk about book promotion and how to harness cyber resources. Writing Children’s Book with Robyn Opie – Sandy will be visiting Robyn Opie, author of more than 75 books including "How to Write a Great Children's Book" and the novel “Black Baron”. Sandy will be discussing Zen and the Art of Writing for Children – her view on why the series has been so successful. Alphabet Soup – Magazine editor Rebecca Newman will be interviewing Sandy about her research techniques and asking questions to discover whether all that historical research is really any fun. The Book Chook – Writer, reviewer and children’s literature advocate Sue Stephenson will be interviewing Sandy about how her own children’s reading experiences have influenced her writing. Words and Pictures – Writer and artist Jefferey E Doherty will be interviewing Sandy writing illustrated novels – the artwork, graphics and working with an illustrator. I hope you enjoy Sandy's Monkey Fist blog tour. I love the broken lamp story! This was another lovely place to stop. Nearly had ME jumping on my bed. Individuals must appreciate the art of writing because it will be beneficial to them in the future.